Less than 24 hours after White House press secretary had spouted numerous falsehoods about inauguration crowd size and more, Kellyanne Conway went on NBC's "Meet the Press" to defend him. In the process, the counselor to President Donald Trump coined a phrase that's now deigned to follow Trump throughout his presidency — "alternative facts." I imagine that they meant "destined", not "deigned". 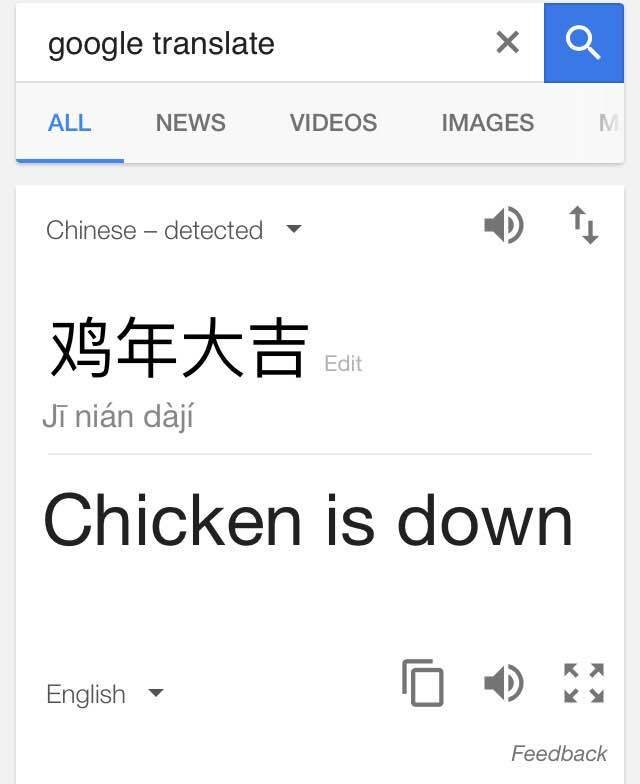 The inability of Google Translate, Microsoft Translator, Baidu Fanyi, and other translation services to correctly render jī nián dàjí 鸡年大吉 ("may the / your year of the chicken be greatly auspicious!") in various languages points up a vital distinction that I have long wanted to make, and now is as good a time as ever. Namely, just as you could not expect these translation services to handle Cantonese, Shanghainese, Taiwanese, etc. (unless specifically and separately programmed to do so), we should not expect them to deal with Literary Sinitic / Classical Chinese (LS / CC). The following ghastly photographs of a rat that was caught stealing from a convenience store in Heyuan, Guangdong province have gone viral on Chinese social media. The photographs following the page break may be upsetting to some readers. To say that someone has "lied," an active verb, or has told a "lie," a more passive, distancing noun, is to say that the person intended to deceive. His "active verb" is not transitive, so it doesn't have a passive version; and his "passive, distancing" counterpart is not verbal at all, and hence has nothing to do with passive constructions. What on earth does he think these terms mean? Nouns have nothing at all to do with either the grammatical concept of passive voice or the rhetorical concept of distancing oneself from the content of a claim. I commented back in 2008 on the ridiculous vagueness of some of the brief weather forecast summaries on BBC radio ("pretty miserable by and large," and so on). I do sometimes miss the calm, scientific character of American weather forecasts, with their precise temperature range predictions and exact precipitation probabilities. In recent days, on BBC Radio 4's morning news magazine program, I have heard an official meteorologist guy from the weather center saying not just vague things like "a weather front trying to get in from the north Atlantic," or "heading for something a little bit warmer as we move toward the weekend," but (more than once) a total baffler: "The temperature is going to be struggling." What the hell is that about? Q: I don't think anyone is disputing that you have the right to say what you want to say. I guess the question was: The march was for women's rights. And the particular joke you made was disparaging towards women and some of the stereotypes you used were—it seemed you were thumbing your nose at what was taking place. Does that make sense to you? A: Yeah, yeah. I was thumbing my nose at what was taking place. Enough already. Let's get on. Women have had rights for … years that I have been alive. I don't see no rights they don't have that a man has. When are they going to get on and move on? I believe if a Democratic president was elected, Hillary, I don't think we would've had those protests. Karen Sumner, who sent me the link, commented: "This is likely an example of a simple and easily-recognized language thing to Language Log folks, but I scratched my head when I saw it. Still scratching, to be honest." I'm in Groningen for the celebration of the 30-year anniversary of Alfa-Informatica. Google has released a fun data visualization tool that shows changes in search interest over time for a variety of trending words, particularly new slang terms. In "The Year in Language 2016," you can see how frequently people searched for the definitions of words, in queries such as "selfie definition" or "define selfie." By this metric, the top 10 words for 2016 are: triggered, shook, juju, broccoli, woke, holosexual, shill, gaslighting, bigly, and SJW. You can also plot the search interest for more than 50 words from 2013 to 2016.
which I guess can be approximated via Unicode as SIGNIFICΛNC≡.